Kraft • 2" x 2" x 2"
Pearl Ivory • 2" x 2" x 2"
Pearl White • 2" x 2" x 2"
Pearl Blue • 2" x 2" x 2"
Pearl Sky • 2" x 2" x 2"
These little gems of boxes are designed and manufactured right here in our Portland, Oregon shop, using American-made paper. They measure 2" x 2" x 2" square. The lid pops open and snaps shut. The heavy-weight paper is coated with a durable and beautiful pearlescent finish. 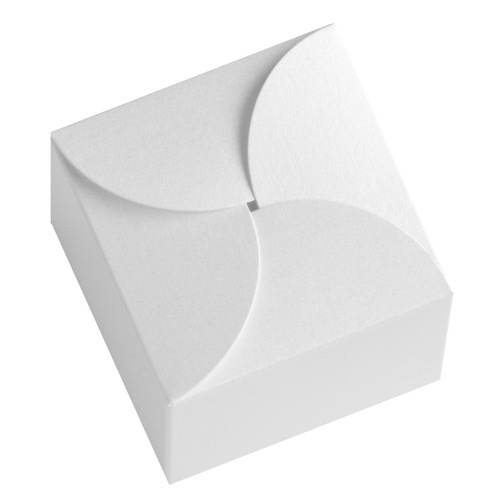 Boxes are die-cut and scored for easy folding. Instructions are included, which are clearly written and easy to follow. The boxes are water- and oil-resistant, so If you plan on using them for something like cake or buttery cookies, they will hold up but may become discolored. To protect the boxes and retain the freshness of your product, we recommend lining them with a strip of wax paper, or using little cookie or candy cups (similar to cupcake wrappers only smaller). Decorate these boxes with tags affixed to the top, and/or labels on the sides. 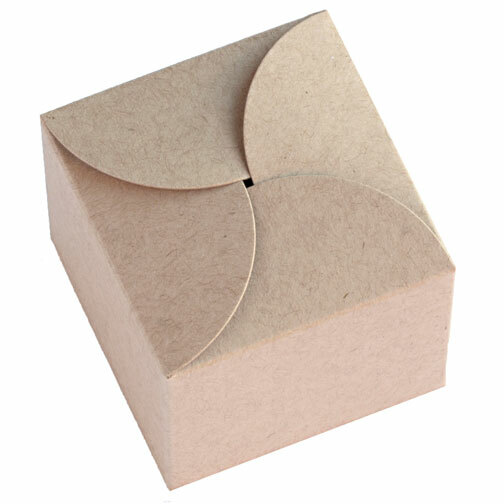 The perfect label shapes for these boxes are the scallop shape 23 and square shape 1B. The boxes are completely recyclable because they are made of all paper with no glue, metal or plastic components. Your purchase of clasp-top boxes provides jobs for Americans, and we thank you for your support!